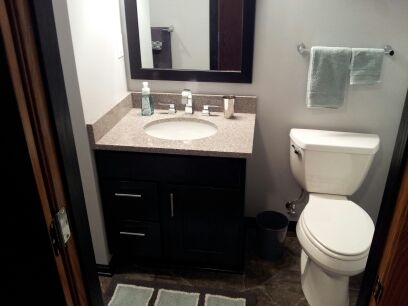 Townhome Bathroom Addition – Allrounder Remodeling Inc.
Our client wished for her powder room to become a full bathroom. Our challenge was that there was no available interior space available. In addition, the townhome association would not allow us to add-on or modify the exterior of the home. 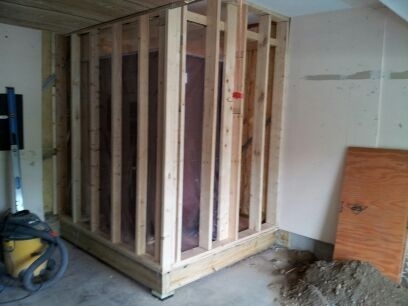 After discussing a few options, our client decided to occupy part of the attached garage with her new bathroom. Our design team worked to develop the structural plans necessary for adding on. We also worked with the townhome association and the city inspection department to work up a design and plan that satisfied everyone. 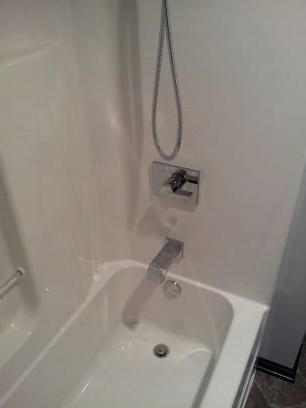 Inside, the new addition houses a simple tub/shower combo unit and toilet. A custom linen cabinet and vanity are finished with custom black stain. A low-maintenance quartz countertop sits atop the vanity. The luxury vinyl sheet flooring mimics the look of slate tile. Underneath it all, upgraded plumbing and electric mean that our client won’t need to worry about these systems failing down the line. A new exhaust fan ensures that the new space remains fresh. 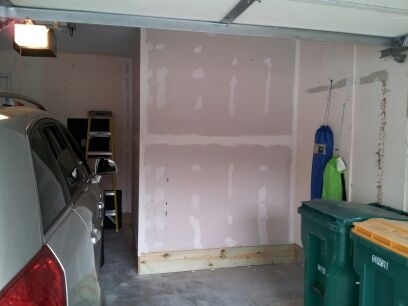 In the end, our clients 2-car garage became a 1-1/2 car garage. 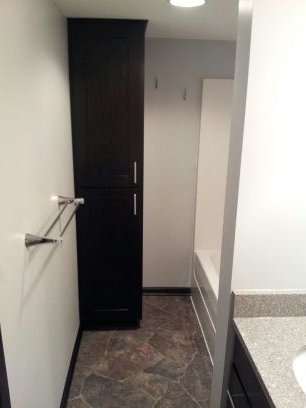 This solution may not work for every client, but in this instance it accomplished our clients goals without sacrificing space that was important to her.